Metropolis is the building that started the Midtown condo boom. It was built in 2002 and features two 21-story concrete & steel towers comprising 498 condominium units, street level retail, and a parking garage with 820 spaces. Individual units have contemporary, soft industrial styling with high quality finishes, 10' ceilings, floor to ceiling windows, exposed concrete and mechanicals, and an array of 1 and 2 bedroom floorplans. Kitchens feature maple or cherry cabinetry, granite counters, and stainless steel appliances. Most units are pre-wired for surround sound, and many feature walk-in closets. Exposed concrete floors are standard, but many units have been upgraded with hardwoods. Metropolis offers an array of excellent amenities including a very groovy lobby with concierge and controlled access to both residential towers. Listing information last updated on April 24th, 2019 at 6:42am PDT. If 10th street is the heart of Midtown, Metropolis is certainly the heartbeat. 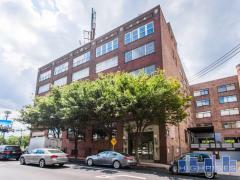 There are plenty of studios and single-bedroom units for anyone wanting an intown pied-a-terre and larger units for those wanting space in a prime location. The building also sits on some of the most popular retail and restaurant space in the area. The 7th floor is a wireless hotspot and houses the private amenities including: an outdoor swimming pool; grilling patio with landscaped sitting areas; a beautiful rooftop terrace; a high quality fitness center; and a well-equipped clubroom with catering area, computers, and plasma theatre. All Metropolis condos are wired for high-speed internet and cable television and the entire building has controlled access and security cameras (including the garage). Metropolis also has street-level retail featuring a variety of shops, restaurants and services. It is located in the heart of Midtown with easy access to all this vibrant neighborhood has to offer. Have any comments or questions about Metropolis Condos? Ask your question and/or share your thoughts about this Building.